In Supply Chain, there is a lot of work that goes from the placing of orders of products to the delivery of the materials to the customer and therefore if the following wastes are not controlled, the chain can become very inefficient on the way. 1. Transport – Unnecessary movement of materials, parts of the finished product to / from the warehouse, to / from other areas or processes. 2. Inventory – Excessive storage of raw material or materials, product in process and finished product. 3. Motion – Any physical movement or displacement that the personnel perform that does not add value to the product or service. 5. Over production – Making more than is IMMEDIATELY required. Process items earlier or in greater quantity than the one required by the client. 6. Over processing – Perform unnecessary or non-valuable procedures: counting, accommodating, inspecting, reviewing or duplicating processes. Use inappropriate tool or equipment, develop features or functions in products that are not valued by customers, etc. 7. Defects – Correction of errors and re-work derived from the identification of nonconformities or returns of the customer, destroy or re-process products that do not meet the optimal conditions of quality, etc. 8. Skills – Do not take advantage of the creativity and intelligence of employees, their skills and potential to eliminate waste, improve productivity, solve quality problems and innovate. Since 19th century, an elevator as a transport to the space has been a dream, something unrealistic, according to Elon Musk (click on the name to check the video). Well probably it was some years ago, but thanks to nanotechnology advances it has become already a project. A project hold by a japanese company named Obayashi corporation, who plans to start the construction in 2025, wants to create an elevator from earth to the moon. It will allow transporting cargo and humans into space, being able to save up to 90% of space transport costs of payloads. It consists in a 96.000 km long nanotube cable. Just the cable could take 20 years to build. Next video shows virtually how it would be and gives some interesting information (some already mentioned) about the project and the material needed. Nowadays it is just a project, a lot of sceptics argue against the viability of the project, others trust on the team behind it. But avoiding this information, Can you imagine how this project could change the spacial logistics forever? It could avoid the use of rockets, it could hugely reduce transportation costs, it could help us to reach easier spacial research, and so on. Is it feasible? What do you think? Leave a comment below and let me know your opinion. The queueing problem that affect us every friday. Last friday we were wainting for take our lunch in the Trinquet Restaurant. And Arguisti say to me that it could be a good example that we should study in this blog or in class. So I ask him if i could write it, and he gives me the OK.
6 waiters that they arrive at different hours and they go home after its 9 hours (7.30-16.30, 8.00- 17.00, 9.00-18.00, 9.30-18.30, 10.00-18.00 and 11.00-20.00). This strategy allows it to have the restaurant opened from 8 am till 20h and the full staff working at the peak hour from 14.00 to 15.00. In the next image we can observe the layout of Trinquet’s restaurant. Firstly, there is the kitchen where the 3 cookers receive the food, store it and cook it. Secondly, in the public place, there is one place to take one dish menu or sandwitches which is served by 2 waiters. One coffee and snacks place served by one waiter. And another place where the students take their menu by two waiters. Finally, there is a place, tipically for teachers, where one waiter serve the menu for them. In this peak hour, the time that you spend from you arrive to the menu’s queue, till you pay it’s about 15 min. If you arrive earlier (14h) or later (15h) you will spend between 10 and 15 minutes and if you arrive at 14.30, you could spend almost 20 min. One thing that they already do very well is that cookers bring the food to the showcase. Avoiding that one of the waiters has to go for it. -The coffee waiter could help to refill or collect money to the menu place. -Put in a paper, near the cash machine that the price is 4.90€, with two dishes, dessert and water, and it you take another drink 5.20€. This way, no-frequently students could know how much it is, and have the money prepared. Hire one more person, could be a student for working from 14h till 15h, 13h till 15h or 13h till 16h. We hope that this post makes you think about possible solutions in order to collect them and explain it to the restaurant Staff. 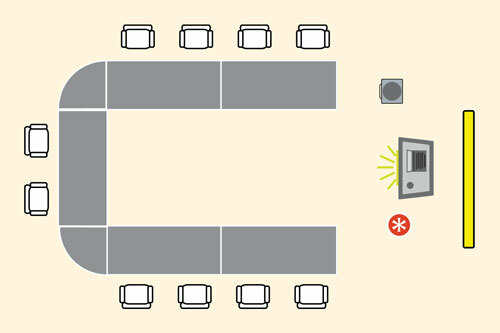 One of the things that our Logistics teacher emphasizes more is the layout of the classroom – as well as our group layouts. So trying to find which layout would be the best, I have found that there is no a perfect layout, because each of them are useful for different situations, and its election depend on what do you want to transmit and on how do you want to do it. In a tradional class all the desks are facing the chalkboard and teachers desk. The layout is suitable for teacher centered classes such as lectures. For smaller classes that want more interaction between the student and educator, a U-Shaped layout is a better option. 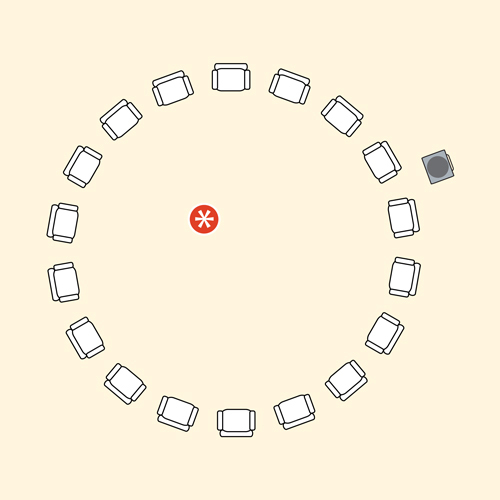 Desks or chairs arranged in a circle or half circle promote community and encourage all students to participate. The supply system plays an important role since it has evolved as warehouse facilities to become centers focused on the service and support of the organization. A warehouse and an efficient distribution center have a fundamental impact on the overall success of the logistics chain. Therefore it must be designed according to the level of the manufacture of the product, using the necessary tools, be supported by an excellent layouts, information system and distribution. The objectives of design and layOut in a company or business are to improve and facilitate the speed of preparation of the most efficient products or services, precision and distribution. All these characteristics focused on achieving the competitive advantages within the strategic plan of the organization thus obtaining a better pace in its services and satisfying the client. – Large moving items should be near the exit to save time. – Transporting uncomfortable articles and difficult to move to an area that minimize work. – The spaces must be efficiently established in order to easily obtain our materials. – All materials that require it must be identified and protected. – All components against fire and safety must be located according to their scope. Below we will see a brief video where it shows us how the requirements in the execution of a wholesale distribution to the right people, the right product and in the right time. The general focus for the effect of the distribution of work centers is to order workplace with similar processes in order to optimize their relative location. In many facilities optimum location often means that large volume work centers between departments are placed side by side. In my years of experience, I have been able to know the different basic formats of distribution can be: Distribution by functions, assembly line and distribution by project. Distribution by functions, occur when a group of functions or similar equipment, are located in the same are of work in the company. The parts in production advance with a preset sequence of each operation. 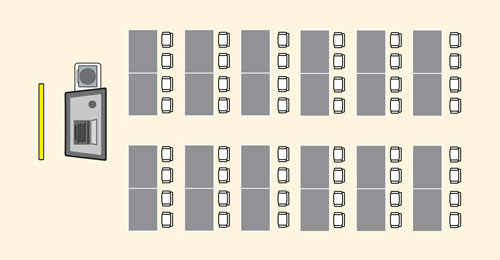 This type of distribution is common in Hospitals (maternity rooms, intensive care unit). A good example of this distribution, was the one known through the visit to FORD company, where the work areas are divided by specific functions, (Painting, welding, molding, mechanics). But also they have a assembly lines at the end of the production chain. The assembly lines, are present when the route of the product or the parts that compose it are in straight line while the transformation or assambly occurs, such as car washes. This is very used in large volumes of production, specially in textile factories or production of alcoholic and non-alcoholic beverages. The distribution by project, in this case the product stays fixed in a place during its manufacture and the production equipment goes to the product. This is common in products with a high weight, as a boat manufacturing amd plane manufacturing. This is a hybrid between assanble lines and work centers (distribution by functions). It is widely applied because of its flexibility to work and maximum utilization of human labor. The image shows some of the ways that improvements to assembly lines can take. My purpose with this topic is, recommend to all the class group the use of U-cells to facilitate human relations, improve the experience of each participant, have less material on the study table and prepare faster assignments made in class. For the queuing task I explored an everyday life problem. While dancing in a club you get thirsty and you want to get a drink. There are 2 bars, one with 10 people standing in a row and one with 10 people creating a crowd and are “fighting” to get a drink. Which bar should I choose? Regarding to a SPIEGEL article scientist Refael Hassin (iniversity of Tel Aviv) says the crowded bar is the better one. While you know in a sorted queue you will be the eleventh one, in the crowded bar you have a good chance to get your drink earlier. The hardest thing to calculate is in every situation the influence of the luck/chance, which makes every case complex. Regarding to our students perspective this can be a damage of an airplane you wanted to use or if in the queue of your supermarket someone wants to return a product. A solution of the supermarket queue already exists. According to the scientist Alexander Herzog (University Clausthal) only one big queue instead of many small queues (Multi-Queues) is the smartest way. The system is used at German Post, or at airports.